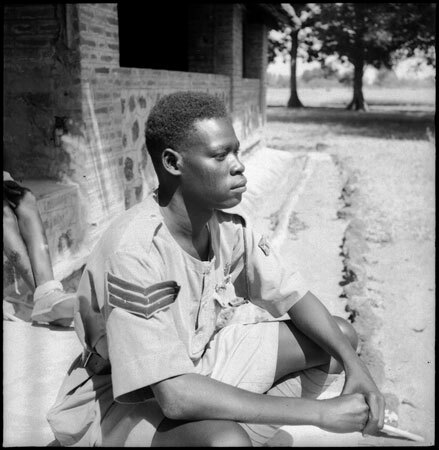 A close-up portrait of Jean Buxton's Mandari sergeant, Makelele Nyayo, who was charged with looking after her personal safety, sitting on the steps of a brick building. It is possible that this photograph was taken by Godfrey Lienhardt during his visit to his student Jean Buxton's fieldwork area among the Mandari in 1950. Morton, Chris. "Buxton's Mandari minder" Southern Sudan Project (in development). 03 Jan. 2006. Pitt Rivers Museum. <http://southernsudan.prm.ox.ac.uk/details/1998.97.188/>.